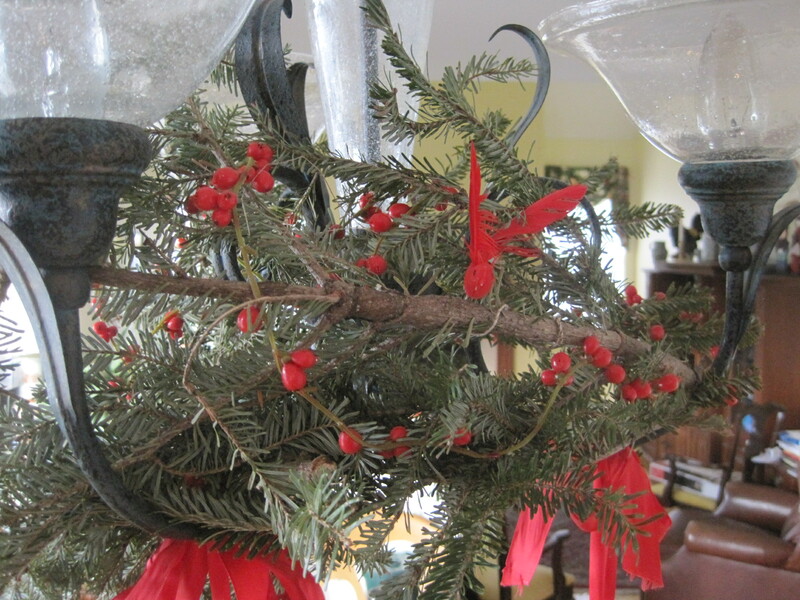 Clump #9: Put away rest of Christmas decorations. 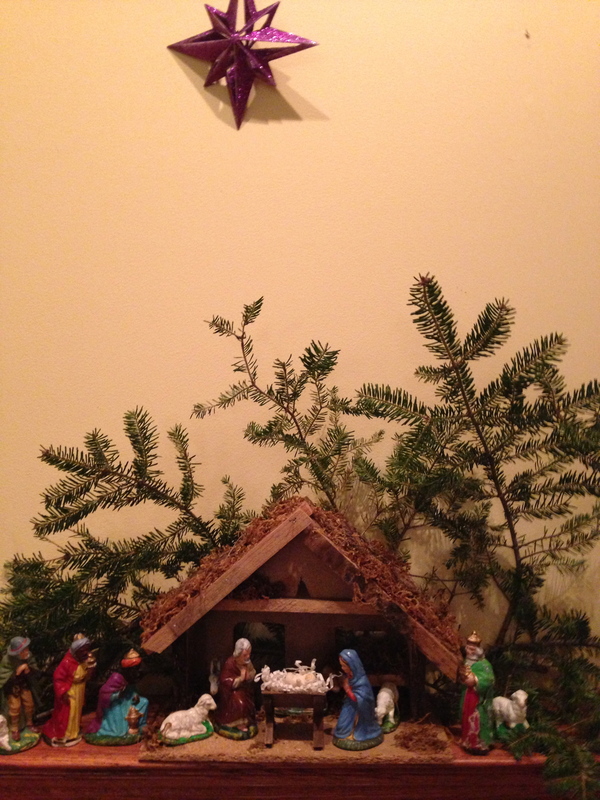 My older daughter made this arrangement. She’s now returned to her new-adult world, and it pains me to take such a pretty arrangement apart. 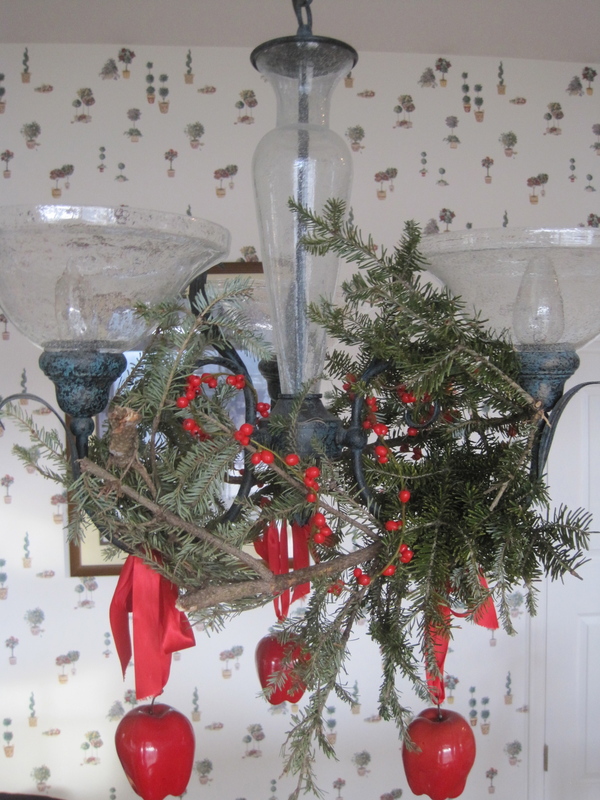 We’ve done this for years: cut up pieces from the lower, trimmed-off branches of the tree, and tie onto the kitchen light. 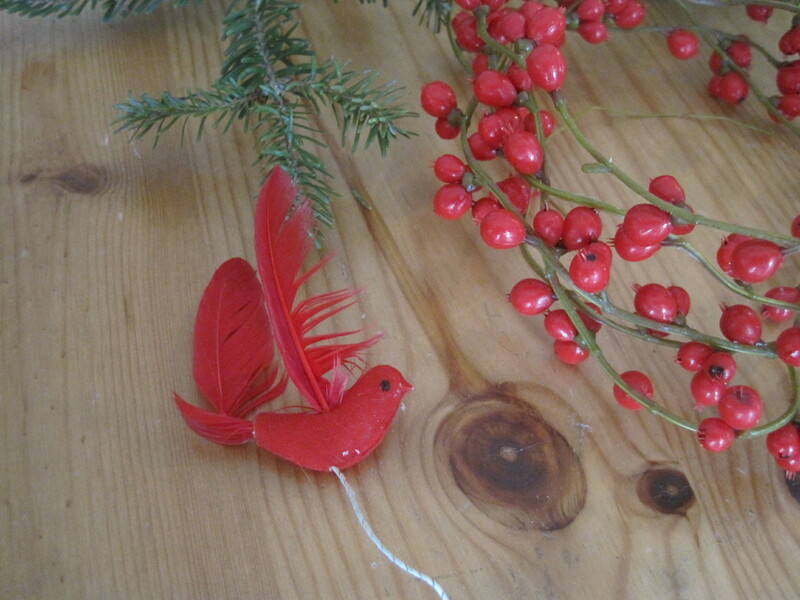 This year she added the string of fake berries and a cute little red bird. Makes all the difference! Ages ago I copied the idea from an Ikea holiday flyer. 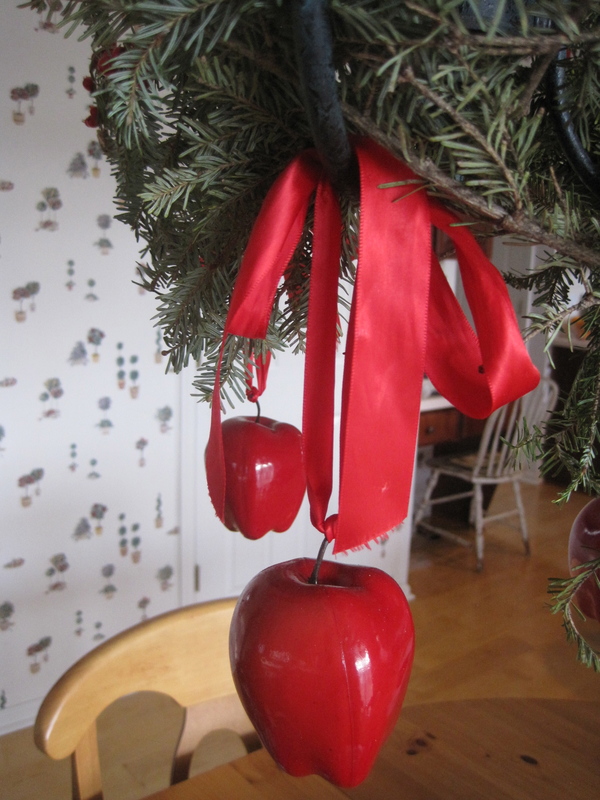 Artificial apples on ribbons look festive, and seem right hanging over the kitchen table. 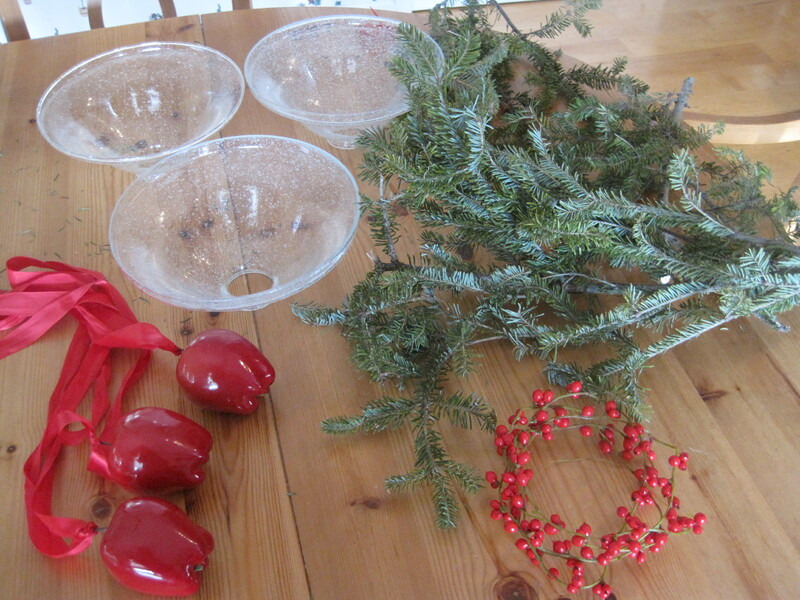 The glass bowls of the light get windexed … at least once a year, whether they need it or not! Until next year, little bird. Another use for the extra tree-greens. Landscaping for the creche. 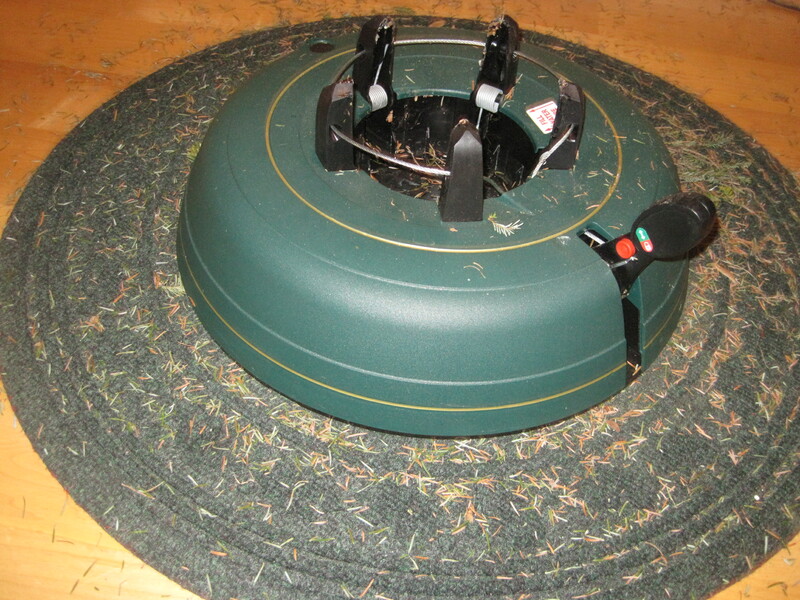 The BEST tree holder and rug. All the years we (my husband, actually) struggled and strained with the screw-in kind, trying to get the tree straight, so many adjustments, so many aches and pains. This is a piece of cake. Presto! The rug is a super-absorbent type, I think from L.L. Bean. Here is the very best thing of all. 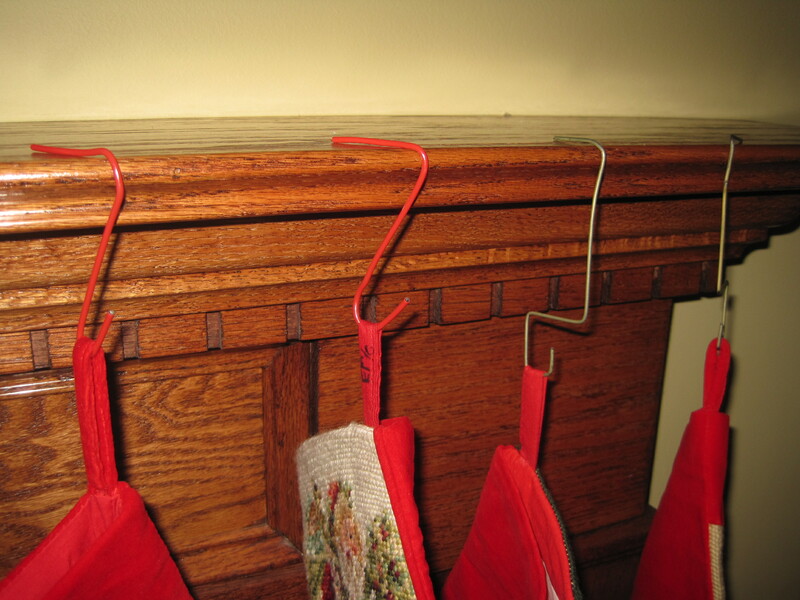 My father, who passed away last August, crafted these stocking holders out of wire hangers. When I look at them they remind me so much of him: he was a strong, no-frills, do-it-yourself guy, frugal, practical, and, obviously, inventive. It’s amazing how much weight these little things can hold. Does everyone know this trick? 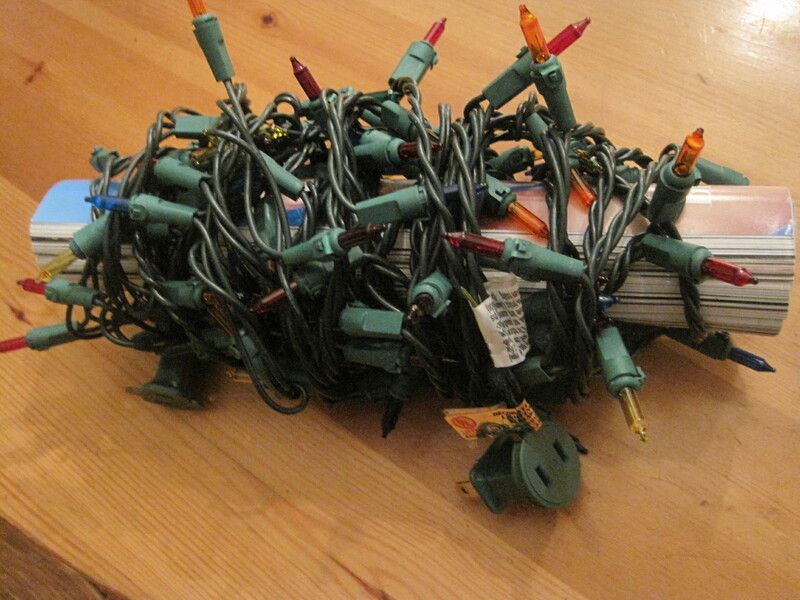 Keep a string of lights from becoming tangled by winding it around a rolled up magazine. 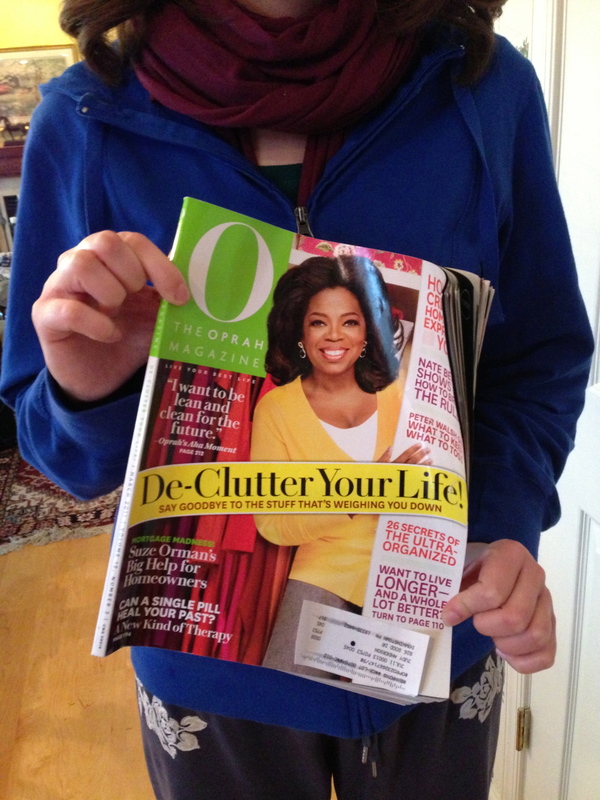 You can save all those wonderful clutter-busting magazines … make your clutter work for you! In a recent post I typed gag for bag, and look what happened. 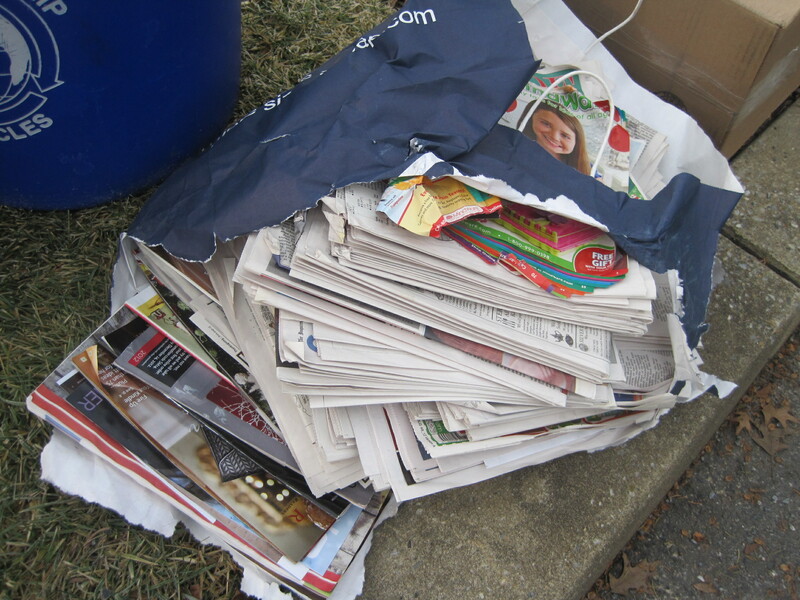 A bag of paper threw up on the curb! I ran inside to replace it, and had to laugh at the message I was leaving for the neighborhood. Life is a special occasion! Not just at holiday time. 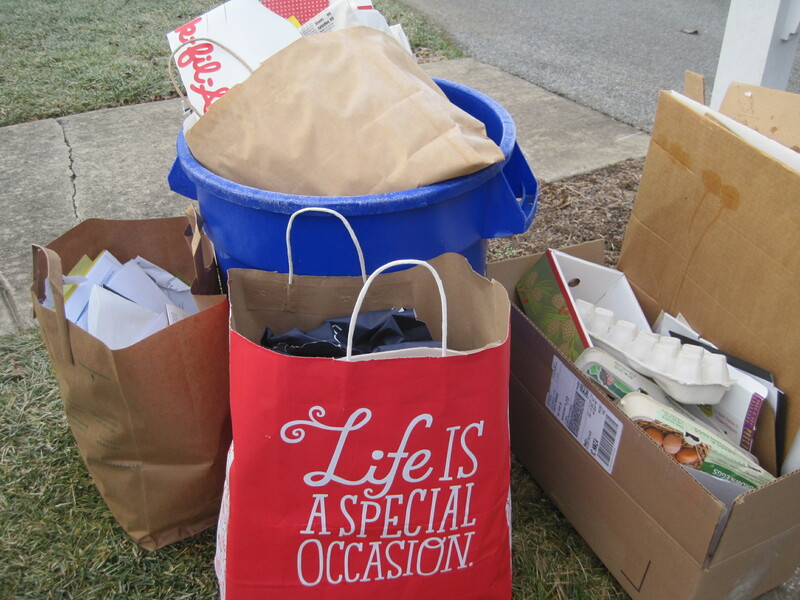 Note to self: tell neighbors why I am taking pictures of our garbage. ← Previous Post O Tannenbaum!